sentimental heart: Warning: I'm a downer today. Warning: I'm a downer today. I can honestly say I've never felt more upset on campus. Tears welled up in my eyes and I could feel a giant tantrum building. I scooped up the broken pieces and the frame and hurried to class. Needless to say, my Philosophy class was filled with multiple deep sighs. I'm hoping I can send them in to Ray Ban to get them fixed! 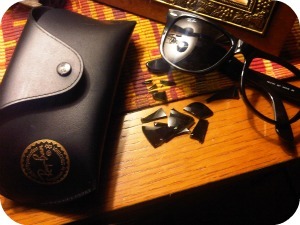 Other than the Ray Ban tragedy of 2011, today was somewhat normal. I opened at work, which means a 4am wake up call. I was SUPER tired but made it to bootcamp anyway! My thighs are on fire, but it's a good burn. I have a really fun post planned for tomorrow (since I will actually have some time), so stay tuned!